The Penguins came into tonight's game against the Rangers with a chance to pull within 2 points of 2nd place in the Metro Division with a game in hand. 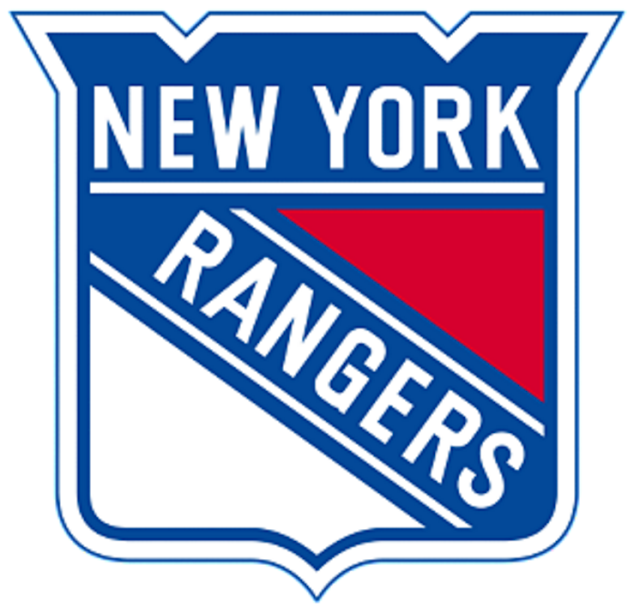 The offense was red hot, Sidney Crosby had several active scoring streaks, and the Rangers were without key contributors Ryan McDonagh and Rick Nash. It was a golden opportunity for Pittsburgh, but Henrik Lundqvist was more than up to the task by stopping all 34 shots in propelling New York to a 3-0 shutout. The Penguins dropped to 6 points behind the Rangers in the standings and find themselves tied for the final wild card spot with the New Jersey Devils. It was bad timing on the loss for a Pittsburgh team that came into the night having won 6 of their previous 7. The opening period was a fast-paced, back and forth affair that didn't result in much offense. 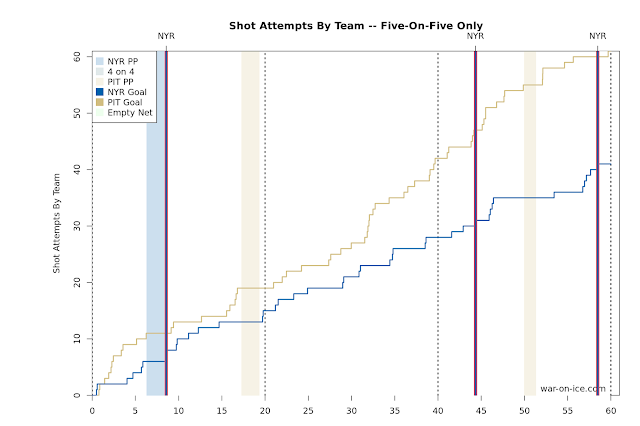 Pittsburgh led the way in possession, but it didn't translate to the scoreboad. The Penguins got good pressure killing off a Kris Letang hi-sticking pentaly about midway through the period, and managed to kill of the Rangers' power play, but New York was able to get on the board seconds later. Marc-Andre Fleury appeared to lose his footing while hugging the post on a Tanner Glass shot from the left boards, and Kevin Hayes managed to grab the rebound, skate his way to a clear shot, and shoot it into an open net. The Pens got a power play of their own on a Dylan McIlrath interference penalty, but they weren't able to convert any of their chances and the game went to intermission with New York in front 1-0. The Pens came out down a man in the 2nd as Trevor Daley remained in the locker room after crashing hard into the net in the first period, but they almost tied things up minutes into the period. Connor Sheary took a Kevin Porter feed in the neutral zone and split the defense to get 1-on-1 with Henrik Lundqvist. He beat Lundqvist high on the glove side, but his shot pinged harmlessly off the post. The game continued in much the same manner as the first, with neither team being able to sustain much in the offensive zone and the game going back and forth. The Penguins continued to turn up the pressure on the Rangers, and the team got a great chance late in the period as Bryan Rust and Tom Kuhnhackl came in on a 2-on-1, but the Kuhnhackl one-timer had no chance and was turned aside to the corner. Unfortunately, it just happened to be one of those nights. The refs were calling a tight game, and Lundqvist was more than capable of handling things at even strength. The Penguins needed a good push to start the 3rd period, but unfortunately it was Dominic Moore giving the Rangers an insurance goal 4 minutes in. Moore and Chris Kreider came down the ice on a 2-on-1, and Moore was able to snipe a shot past Fleury from the top of the circle. Scott Wilson drew an interference call on Kreider midway through the period, but the power play again wasn't able to beat Lundqvist. A Jesper Fast empty net goal sealed the deal and ended any hopes of a similar 2-0 comeback that was successful Saturday night against the Panthers. The Penguins lost the game despite owning an advantage in possession, controlling a score adjusted 55.3% of the 5-on-5 shot attempts. It didn't translate into goals, and the Pens were shutout for the 5th time on the season. Pittsburgh will travel to Carolina to face the Hurricanes Friday night. They'll need a win to maintain the pace in the playoff race, and a regulation loss will bring the Canes to within 2 points of the Penguins in the standings.